Plainly visible across the intervening water on account of their enormous size was an array of bas-reliefs whose subjects would have excited the envy of a Dore. I think that these things were supposed to depict men — at least, a certain sort of men; though the creatures were shown disporting like fishes in the waters of some marine grotto, or paying homage at some monolithic shrine which appeared to be under the waves as well. Of their faces and forms I dare not speak in detail, for the mere remembrance makes me grow faint. Grotesque beyond the imagination of a Poe or a Bulwer, they were damnably human in general outline despite webbed hands and feet, shockingly wide and flabby lips, glassy, bulging eyes, and other features less pleasant to recall. Curiously enough, they seemed to have been chiselled badly out of proportion with their scenic background; for one of the creatures was shown in the act of killing a whale represented as but little larger than himself. I remarked, as I say, their grotesqueness and strange size; but in a moment decided that they were merely the imaginary gods of some primitive fishing or seafaring tribe; some tribe whose last descendant had perished eras before the first ancestor of the Piltdown or Neanderthal Man was born. 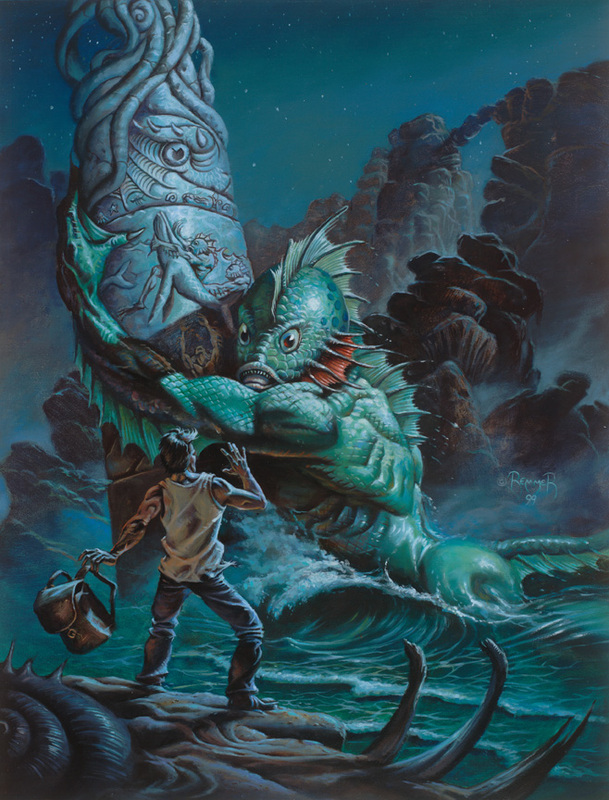 A great article “Lessons from the Vivid Writing of Lovecraft’s Dagon” by Oren Ashkenazi over at Mythcreants is worth a look.